Tooth decay is the result of bacteria in the mouth that forms acid. These acids eat away at the enamel of the teeth leading to cavities. If left untreated, cavities can cause pain, infection, and ultimately lead to tooth loss. 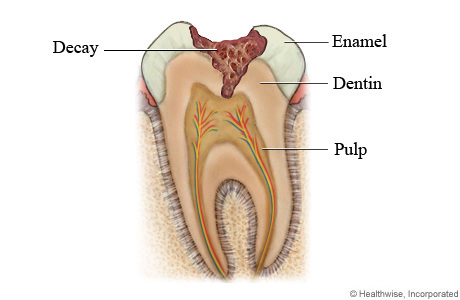 The hard outer layer of a tooth is called the enamel, the middle layer is called dentin, and the center of the tooth is called the pulp. The pulp contains nerves and blood vessels. As the decay worsens, the deeper layers of the tooth are exposed.